A modern law department must have effective technology in place to achieve its performance objectives, and these systems must be optimized to deliver effectively for the corporation. In most law departments, the critical technologies are electronic billing, matter management, document management and contract management, and Morae Global provides deep expertise in all four. We have built partnerships with leading software developers to thoroughly understand their product offerings, compare and contrast the features and provide guidance to our clients during the selection phase. Our professionals have deep experience implementing and working with matter management/electronic billing systems including Bottomline, CaseTrack, Collaborati, CounselLink, eCounsel, Law Manager, Lawtrac, Onit, Passport, Serengeti Legal Tracker, TeamConnect, TyMetrix and many others. But at Morae Global, we know that technology is not enough. It is the combination of technology with strategy, people, process and data that ignites performance. Technology and process expertise. Because we view technology as a key advantage for law departments, only Morae Legal has the expertise to fully leverage technology as a tool to support process. We pair the right processes with the right technological functionality to build systems that work for the legal team. Plan activities to foster law firm/vendor engagement and adoption. 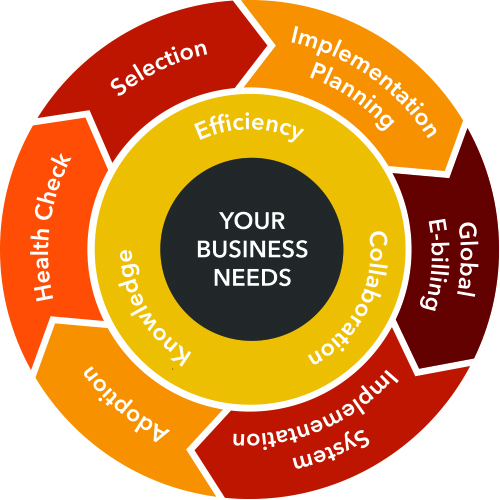 Provide best-practices advice for implementing e-billing in 100+ countries including regional needs, restrictions and requirements for electronic invoice intake, processing, archiving and payment. Develop custom on-boarding packets and onboard to systems. Develop collaborative financial processes to manage spend such as budgeting, reserves, accruals and AFAs.